SHIJIAZHUANG - A sprawling building complex, about the size of 14 soccer fields, in the Xiongan New Area, gives a glimpse of how future cities may look. 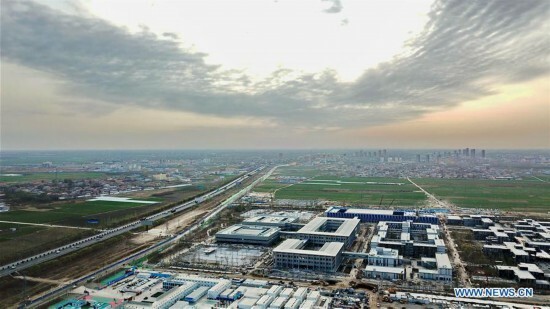 In 112 days, the Xiongan Public Services Center, including eight separate buildings, were completed in Xiongan, an new economic zone about 100 kilometers southwest of Beijing. China aims to build the area into a low-carbon, intelligent, and globally influential city where people and nature exist in harmony. Workers used more than 30 new environmentally-friendly construction technologies. Building materials are prefabricated and assembled, with minimal impact on environment. Construction was three times faster than regular building work. Construction waste was reduced by 80 percent. The site includes 210,000 square meters of gardens. No fossil fuel cars are allowed to enter the center area. The walls are made from insulating materials. The indoor temperature can be kept above 16 degrees Celsius in winter without having to turn on heating. There are over 20,000 sensors in the area. Facial and sound recognition applications are widely used. Shops are unmanned and an intelligent bus system allows buses to depart according to the number of passengers. In April 2017, China announced the establishment of Xiongan New Area, spanning three counties in Hebei province. Xiongan is another new area of "national significance" following the Shenzhen Special Economic Zone and Shanghai Pudong New Area.